Tá súil agam go mbeadh sibh in ann teacht ar rud nó dhó nua anseo. Seo, go bunúsach, na suíomhanna ar líne go mbímse ag baint úsáide as go laethúíl. I hope that you can all find one or two new ideas here. This is, essentially, the sites online that I use for maths on a daily basis. 1. Áiseanna as Gaeilge chun mata a mhúineadh http://www.nicurriculum.org.uk/irish_medium/key_stage_3/areas_of_learning/matamaitic.asp Taca le Mata : go leor bileoga oibre (Leibhéal 5 in úsáid agam le Rang 6) agus Luaigh Airgead, Déan Mata : bealaí iontacha an mhata a choinneáil suimiúl agus réalaíoch do na páistí. 3. Classmaths.com http://www.classmaths.com/ – cluichí matamaitice agus iad briste síos de réir snáithe an churaclaim. Maths games broken down according to the curriculum strands. 4. Illuminations http://illuminations.nctm.org/Search.aspx?view=search&type=ls&gr=6-8 – Mata Gníomhach agus Imscrúdaitheach atá go hiontach sna hardranganna. 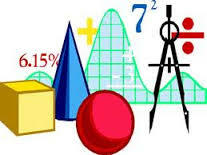 Active and investigative maths lessons for the senior classes. 5. Maths Drills http://www.math-drills.com/ – go leor bileoga oibre ar fáil anseo. Cé gur suíomh as Béarla atá ann – is féidir fós é a úsáid go minic toisc gur druileanna atá i gceist. Lots of worksheets available here. Although in English – they are still often useful as it’s drills rather than word problems for the most part. 6. Starter of the Day – http://www.transum.org/Software/SW/Starter_of_the_day/ – Seo suíomh iontach chun tús a chur le ceacht mata – nó tús a chur leis an lá fiú. Athríonn an puzail nó an fhadhb gach lá agus is féidir dul siar ar na sean-phuzail chomh maith. This is a great site to use for starting a maths lesson, or for starting the day even. The puzzle or problem changes each day and you can look back at previous puzzles. 7. UK Numeracy Strategy http://www.edu.dudley.gov.uk/primary/Strategymaterials/nnsdocuments.htm – cé go mbíonn sé deacair uaireanta teacht ar an rud atá de dhíth ort ar an suíomh seo, is fiú go mór dul tríd. Tá go leor ann do na leibhéil éagsúla agus é mar chuid den stráitéis uimhreachta sa Ríocht Aontaithe. Although I find it can sometimes be tricky to find what you’re looking for here, it’s well worth going through. There’s plenty there for the various levels and is all part of the UK Numeracy Strategy.